Edward Bach (1880-1936), a physician and graduate of Birmingham University and the University College Hospital, London, became convinced that stress, if unresolved, leads to physical distress. In 1930 he abandoned his practice at the Royal London Homeopathic Hospital and went to live in the country. Once there, he identified medicinal healing agents in wild-flowers. Over a 7-year period, Bach identified 38 flowers with healing qualities and designated them useful for treating emotional conditions. The process by which he developed his remedies included taking the heads off wildflowers, placing them on the surface of water contained in a glass bowl, and leaving them for 3 hours to absorb sunlight and transfer their essence to the water. The flowers were then removed and the water was retained. Blossoms from trees were boiled in a sterile saucepan for 30 minutes (Drury & Drury, 1989). overcare of others (rock water, chicory, vervain, vine, and beech). Within each of the seven groupings, there were subcategories of emotions, each with a specific remedy. Today, there are Bach flower remedies ranging from depletion after illness or long-term stress (olive) to victim role (willow). Lavender, peppermint, sage, and yarrow, additional essences beyond Bach’s original remedies have also been developed (Somerville, 1997). Critics contend that any beneficial effects are due to a placebo effect. Practitioners, however, point to benefits seen in animals and children, two groups supposedly not susceptible to placebo effects. Additionally, there are no known side effects or harmful interactions with drugs or medications. Bach used his remedies singly, not in combination, and only in a water base. Today, some practitioners combine the essences and preserve them in alcohol. To administer, two to four drops of an essence are placed either under the tongue or in a glass of water and sipped throughout the day or used topically or added to baths (Somerville, 1997). 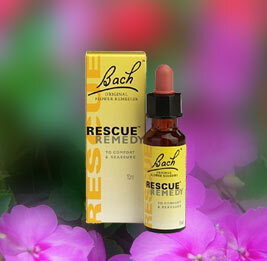 The Bach Rescue Remedy is widely used to produce a calming, stabilizing effect. The active ingredients include star of Bethlehem, rock rose, impatiens, cherry plum, and clematis. Rescue Remedy is also available as a cream and is recommended for shocks and nervous upsets, and as an alternative to over-the-counter remedies in an herbal first aid kit (Ody, 1993).